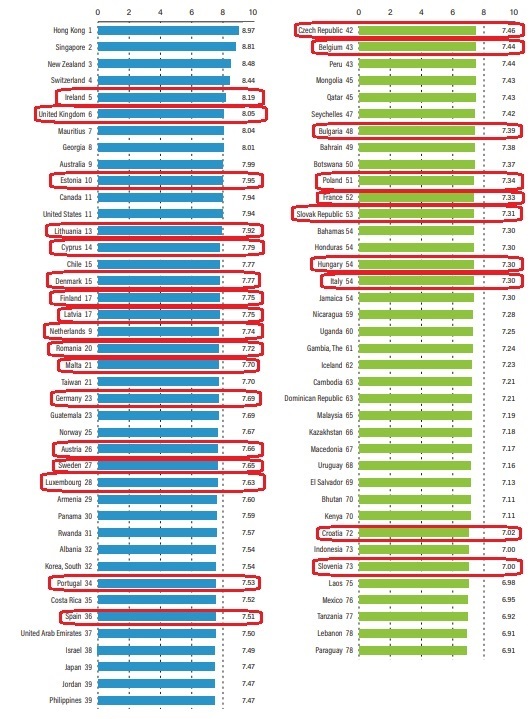 I periodically share data comparing the United States and Europe, usually because I want to convince people that America’s medium-sized welfare state is better (less worse) than Europe’s bloated welfare states. But I sometimes feel guilty when making these unflattering comparisons because Europe – at least by world standards – actually deserves a good bit of praise. 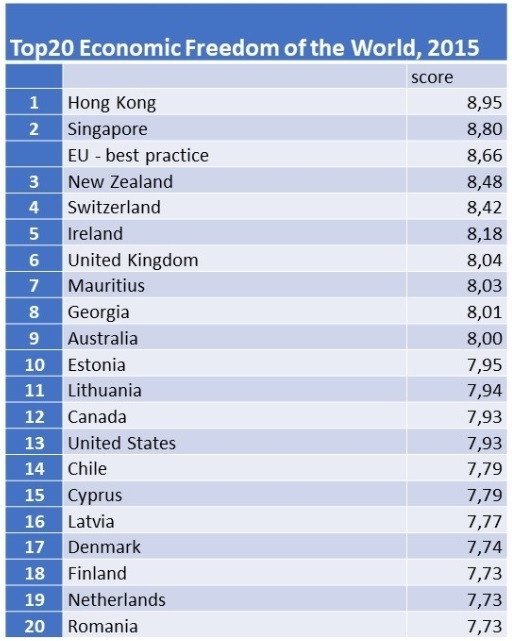 This hypothetical country, based on the best practices of various EU nations, would have the third-highest score for economic liberty – trailing only Hong Kong and Singapore. 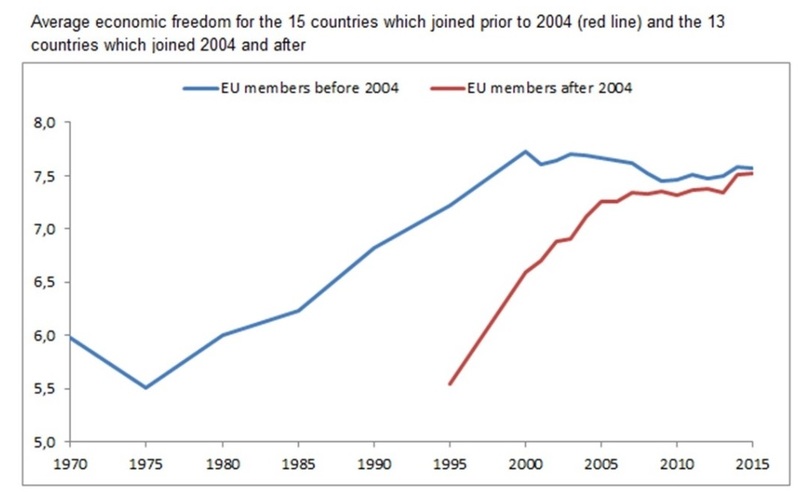 The two major causes of Europe’s impending downfall. as an aside… 40 people died in the Syrian chemical attack… and the U.S. and the E.U. are ready to risk a world war to punish Assad for his government’s policy on the use of chemical agents… and yet E.U. energy policy kills tens of thousands of innocent people every year………………………. 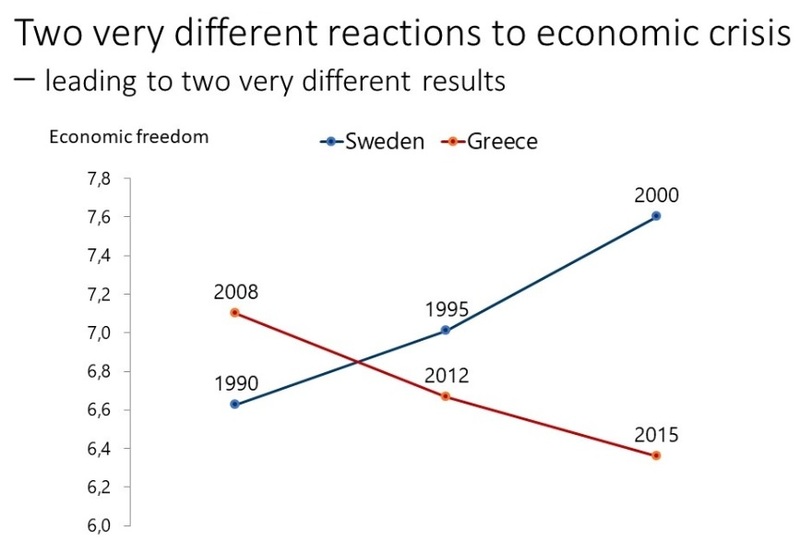 Indeed, through Greece is apparently exiting from the acute phase of its crisis, the country is exiting the crisis with worse fundamentals and much eroded social capital, than it entered. I’m afraid that save a few short rebounds from the depths of the crisis the long term situation of Greece has become absolutely irreversible. For example, a businessman in Greece, e.g. a civil engineer (a once decent profession) now faces an affective tax rate of around 80-85%. Income tax rates quickly climb in the upper 40% and mandatory contributions to government healthcare and retirement are in the upper 30%. With the roughly 15% left you buy stuff subject to 24% VAT. The healthcare system is completely void of reciprocity since government healthcare is the same for everyone regardless of income. The unemployed and even those who never worked get the same treatment (hint: not so good). The retirement system is also highly redistributive with eventual payouts raising very slowly with contributions. With such a flat effort-reward curve there is no hope for anything competitive flourishing in Greece, save the resource curse of tourism, an endowment bestowed on the Greeks by geographical luck. As is typical of resource curses, The tourism endowment is now well on its way to becoming controlled by an oligarchic mafia under the pretext of environmental central planning. PS. 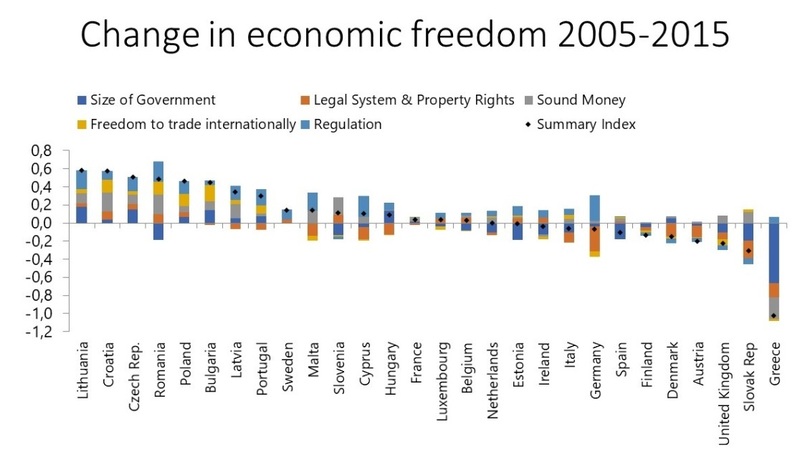 I also wonder, where does the economic freedom index capture something that is so visible from thirty thousand feet in the air, when one compares the US to Europe from an airplane window: the much more free market driven zoning of the us compared to the compartmentalized dirgistic and much more restrictive zoning of Europe. I’m always amazed at how stark of a difference that is whenever I fly between the two continents. In my view restrictive zoning and the way the housing and building supply is created cascades to almost all other areas of economic and social freedom, and in ways that I think few people realize. From housing affordability all the way down to birth rates and the desire to procreate and the resulting demographic crises, if one thinks about it.